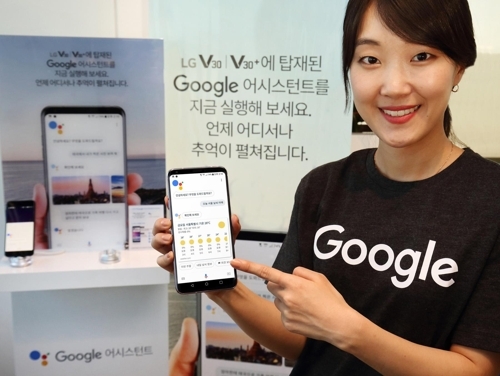 SEOUL, Sept. 21 (Yonhap) — Google Korea, the local unit of U.S.-based tech giant Google Inc., said Thursday it has launched the Korean-language edition of its voice recognition program, Google Assistant, along with the release of LG Electronics Inc.’s V30 smartphone in South Korea. Google Assistant, running on artificial intelligence technology, is anticipated to compete with Samsung Electronics Co.’s Bixby and Apple Inc.’s Siri in the domestic market. The Korean-language program is expected to be gradually applied to smartphones running on Android 6.0 or higher. The release is significant as major tech giants have been rolling out various voice assistant programs. LG Electronics’ G6 smartphone, released in March, earlier adopted the English version of Google Assistant. Users are able to make calls, play music, check the weather, create schedules and surf the Internet by giving voice commands through the Google program first launched in 2016. The program can be activated only by saying “OK Google” or by holding down the home button. The Korean edition is the ninth language to be supported by Google Assistant, along with English, French, German, Spanish, Portuguese, Hindi, Indonesian and Japanese. Google Korea said it hopes to apply the Korean-language Google Assistant on a wider scope of devices in the future.